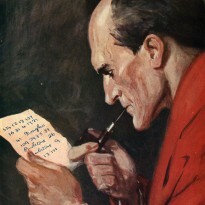 Sherlock Holmes (not to mention the other works penned by Sir Arthur Conan Doyle) has been with me from a very early age, my father being responsible for introducing me to the great detective. As a result, it seemed perfectly logical that when I first tried my hand at writing, I would turn to Conan Doyle’s greatest creation. ‘Requiem for Sherlock Holmes’ was written over a five year period, and was researched in great detail to ensure that it captured the world and characters of Sir Arthur Conan Doyle in an authentic fashion. It is now available in various formats from Lulu and Amazon sites around the world.